Rho-GTPases and Statins: A Potential Target and a Potential Therapeutic Tool Against Tumors? Maria Aparecida Nagai and Brentani M.M. 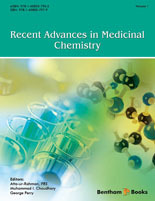 The 1st volume of “Recent Adances in Medicinal Chemistry” offers a very rich panorama of authoritative reviews covering old , as well as new, unexpected issues. Once established, drugs rarely become undisputed therapeutic weapons against one specific kind of disease and reevaluations of such drugs needs to be carried out regularly. The present volume does indeed provide a number of such reevaluations, as, for instance, the aureolic acid group of anti-cancer drugs and the non-steroidal anti-inflammatory drugs (Chakraborty et al.). In the ever-expanding collection of anti-cancer drugs, the aromatase inhibitor tamoxifen has long been the gold standard to treat hormone-receptor positive, early forms of breast cancer. However, new generation aromatase inhibitors show definitive advantages over tamoxifen and these advantages are discussed by Colozza et al. On the same subject, the precise identification of estrogen receptors is becoming of prime importance in deciding which inhibitor to use (Nagai M. and Brentani M.M.). The already widespread utilization of statins may further extend to neoplastic diseases, as statins were shown to inhibit Rho-GTPases (often hyperexpressed in tumors) by inhibiting the synthesis of their prenyl groups (C. Riganti). New molecules such as plant glycosides (saponins) display anti-tumor activity that could be utilized in combination with existing anti-tumor compounds (C. Bachran et al.). Chemoprevention undoubtedly offers effective means to delay or altogether prevent the development of most diseases. Macáková et al., discuss extensively the protective effects of tannins, a group of natural polyphenols with anti-oxidant activity. On the same line, Young et al., consider the activity of carotenoids in the chemoprevention of prostate cancer. Delivery of pharmacologically active compounds and drugs was always of importance to ascertain that active molecules preferentially reach their target cells or tissues, and Murakami et al., review the recent advances in nanoparticular vehicles. Antimicrobials are acutely needed to treat bacterial diseases, especially those caused by micro-organisms resistant to existing antibiotics. Pérez-Castillo et al., review how the 3-D structure of the targeted bacterial enzyme may be utilized to design new antibiotics. Enzymatic activities are essential to carry out biological functions and their perturbations are often caused by disturbances of the intracellular redox potential. In this respect, Nagahara reports on the mechanisms to maintain the cellular redox equilibrium. The plasma membrane redox system is an important property of plasma membranes. In particular, Avigliano et al., review the plasma membrane redox system of blood platelets and the role of anti-oxidant vitamins in this context. The acute spinal cord injuries (traumatic) represent an unsolved problem in medicine. H. Mestre et al., elaborate on the ongoing efforts made to develop a pharmacological way to ensure the neuroprotection of the injured spine. The precise assessement of the levels of pharmacologically active molecules in patients needs to be met and Samanidou et al., review how HPLC (high-performance liquid chromatography) can be utilized to monitor the levels of tricyclic anti-depressants. Lastly, Santucci et al., review chosen instances where misfolded proteins cause pathologies, namely how non-native forms of cytochrome c are involved in apoptosis triggering and participate in amyloid formation. By the variety of subjects reviewed dealing with chemoprevention and treatment of common diseases, the changing scope of action of medicinal chemistry is illustrated in this volume. It is indeed quite possible that our physiology and pathologies also evolve comcomittantly with the drugs we take to prevent or treat diseases. Consolidation, failure of high throughput approaches and rationale design to deliver as promised, and uncertainty of future finances have drawn industry away from innovation to reformulation and repackaging. In this new world, academic research plays an even greater role in drug development, whether built on natural products or novel insights. Blurring of the lines between the traditional fields of chemistry and biology offers opportunities for new discoveries. In this milieu “Recent Advances in Medicinal Chemistry” will find a welcome home. Centro de Investigación del Proyecto CAMINA A.C.